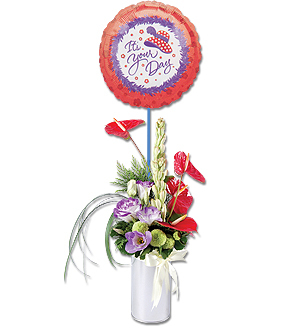 Makes someone's day with a small potted posy of Anthurium and Eustomas with a 9" "It's Your Day" air filled Foil Balloon. 24/7 delivery applies for order within Klang Valley(Kuala Lumpur, Petaling Jaya, Selangor, WP) only. For outstation delivery within Malaysia, deliveries are for working days only and is subject to a minimum price depending on the location. For more information, contact Pods & Petals Giftlab at +603-78830233 / +6012-6915200 or sales@gift-lab.com.